Chantale Charette, the Principal Interior Designer and Landscape Architectural Technician at Studio 853, completely customized this Landsdowne Live Penthouse. 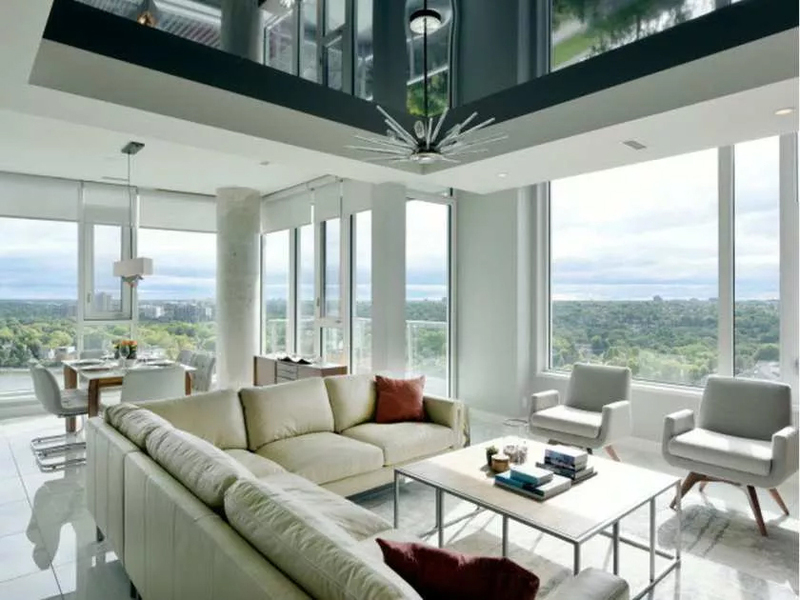 It is the most expensive condo currently for sale in Ottawa. 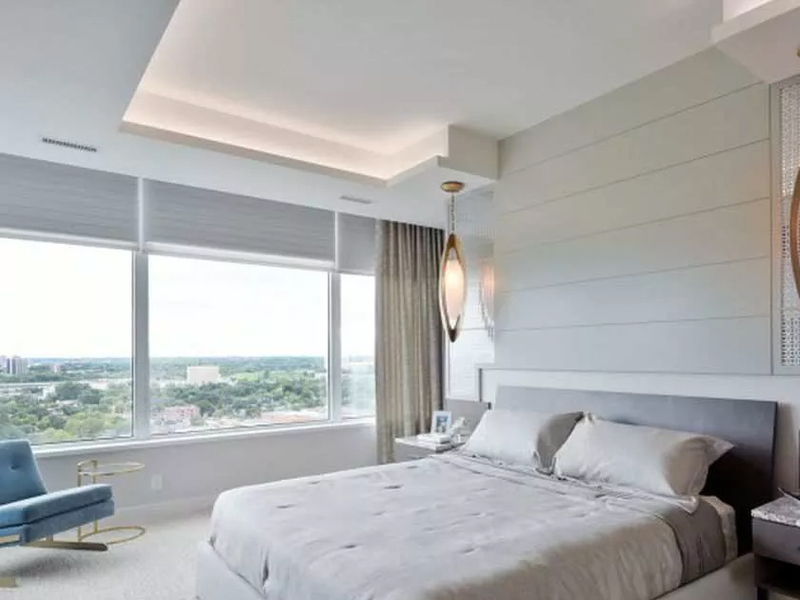 Chantale Charette, the Principal Interior Designer and Landscape Architectural Technician at Studio 853, has plenty of ideas when it comes to finding a condo that suits your own personal aesthetic. I recently sat down with Charette to discuss her style advice for condos. 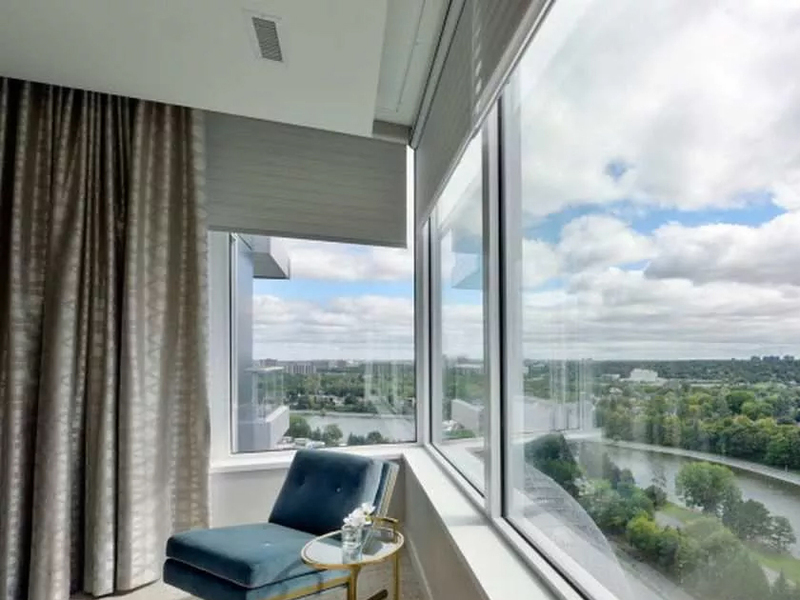 Having completely customized the most expensive condo currently for sale in Ottawa (listed on MLS for $2,650,000), Charette is very familiar with how to make a condo liveable and luxurious. This Landsdowne Live Penthouse, replete with fine finishes and over-the-top details, shows Charette’s ability to maximize storage space, respect views and still create delightful interiors. Charette’s way of creating engaging one-level spaces is to incorporate different heights, depths and architectural details in her design, starting from the foyer. 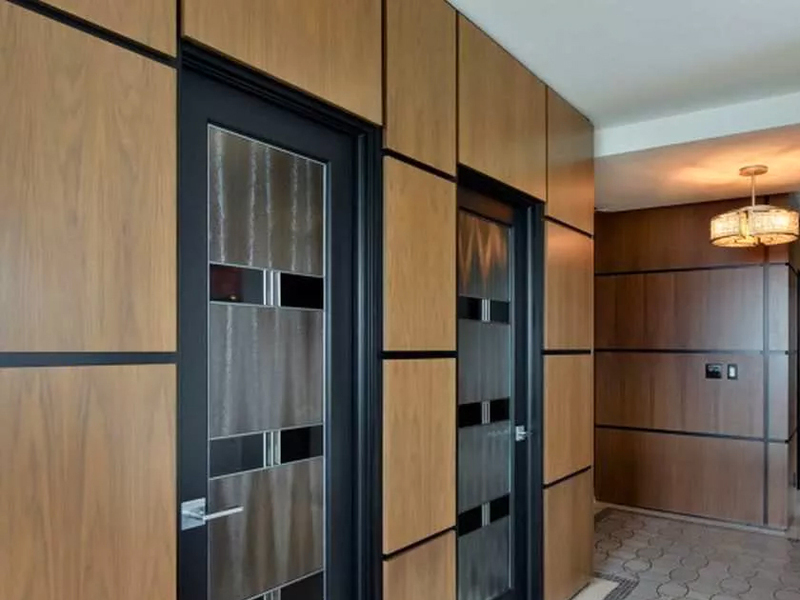 The typical condo entrance does not have a lot of space, particularly wall space. To give this area “wow factor and make it feel bigger than it is,” Charette recommends adding visual texture to the floor or wall. One way to do this is by installing textured wall panels. However you opt to achieve this, be advised that “you should be able to capture the feel of the rest of the unit when walking in.” Through this space, the visitor can anticipate what is to come design-wise in the rest of the space. Incorporating different heights, depths, and architectural details into a space will make it feel larger than it is. One way of doing this is by installing textured wall panels. Be careful not to over-customize to the point that you’re overcrowding the space. Ensure instead that everything you’re creating has its own space, says Charette. The den in the Penthouse unit at Landsdowne is an example of this. It has a custom built-in bar with a wine fridge and sink, perfect for entertaining guests, and a high-top bar with two bar chairs looking out onto the balcony, positioned over TD Stadium. A TV, a couch and light chairs — easily moveable for hosting — complete the small space. This room is a great example of creating useful, purposeful custom details. Be careful not to overcrowd a space. Opt for custom details that have a purpose, especially those that create a space, and opt for furniture that is light and easily transportable so that it can be repurposed in other spaces if needed. Its interior also demonstrates another of Charette’s tips: opt for furniture that is light and easily transportable to ensure your condo interior is versatile. While your dining table may be too small to accommodate a ton of chairs, or your living room restrictive in seating space – having light chairs elsewhere means you can move them into your main living spaces when they’re needed. When they’re not, they’re out of the way, serving their purposes elsewhere. Other general tips include hiding wiring so that it doesn’t trickle down from TVs to plugs, creating a more aesthetically pleasing and luxurious effect. In condos with high ceilings, Charette also recommends establishing a horizontal line by using artwork, a band of fabric, wallpaper, a veneer or anything else with a horizontal line to “break that vertical aspect.” Another great suggestion to enhance the versatility of a room like a den, whose door might often be left open, is to use a barn door instead of a regular one. Make sure that your condo has storage solutions that fit your needs. Some need more space in the kitchen- while others require a well-organized walk-in closet. When it comes to the latest condo trends, Charette says they include mixing metals, “a definite way to have the best of both worlds. With the right balance, we can do gold inlays in tiles and still have our polished chrome handles with that, mixing it up will give it a more layered effect, and add character.” Another great trend is contrasting finishes. “With contemporary design, we love our polished surfaces that give us that nice fresh look, although complementing them with a more natural surface like a medium brown wood will make the modern room still feel very warm and inviting.” In bedrooms, Charette is a fan of high-end carpet flooring. “Carpet is the new luxury,” she says, explaining that it helps absorb noise and feels great on your feet, particularly on a chilly morning. Be forewarned that it’s not for everyone; if you have animals or allergies, you may wish to forgo the carpet. Charette is a fan of high-end carpet flooring in bedrooms since it absorbs noise and feels nice on your feet. “The key to a good lighting design is to have different layered effects of lighting.” This means including varied lighting sources in your lighting scheme. Overhead halogens, sconces and lamps can combine to create interest. One of Charette’s brilliant lighting ideas in the Landsdowne Penthouse was to lower the sconces in the second bedroom’s ensuite bathroom. This meant “having light reflect more on your face,” something that women who apply makeup will particularly appreciate. Another fun idea Charette also used in that Penthouse was to install doors with glass elements, translucent to help foster privacy. This means that when your doors are closed, the hallway still gets some natural light. “If you’re going to do something, do it with intention,” says Charette. It’s a good all-around life lesson, but she’s speaking about incorporating alcoves into your bath or shower. Adding an alcove is a great way of building in storage space where you might keep shampoo bottles and other toiletries. Her preferred method of use is to tuck one into the shower wall least visible to the bathroom door so that the mess is partially hidden. With any type of alcove, “we worry about cleanliness.” This is why using stainless steel or glass shelves – both easily wipeable – is a great idea. When it comes to choosing toilets, Charette also opts for easier to clean one-piece models which have the added benefit of “looking a little bit slicker.” She prefers classic white toilets for their simple elegance. Many people match their bathrooms to one another by using the same tiles, fixtures or flooring but Charette suggests giving each one its own unique flair. In your powder room’s design especially, your motto should be “dress to impress” as it caters to guests and is, in a sense, an extension of your entertaining space. 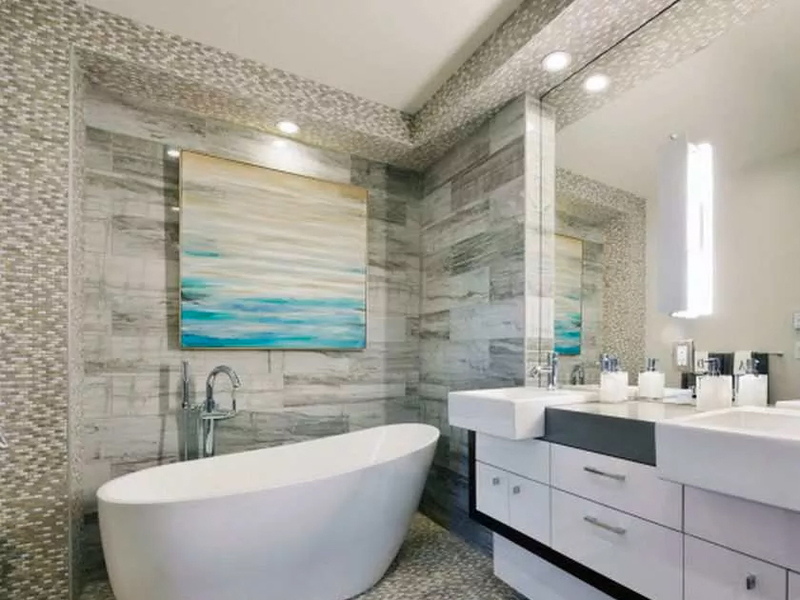 Make each bathroom in your condo have its own unique flair by incorporating different tiles, textures, fixtures, and flooring. When designing your condo interior, keep in mind that “condos should be treated like any other small rooms. Our mandate is to make them efficient, visually pleasing and uncluttered.” If you intend to incorporate textures, mosaics and fun light fixtures, keep the architectural details minimal.